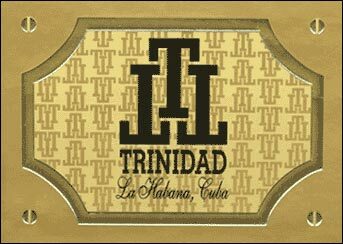 Discount Trinidad Cigars cigars store have the lowest online prices on cheap cigar. On the threshold of the new millenium, enters the market with the vitola Fundadores, which has a format that does not exist in any other brand of Habanos and gives it the elegant and seigniorial aspect that describe the Trinity of Cuba. The mysterious blend, considered by the experts as having a medium strength, is a creation of the most experimented cigar makers of the factory "El Laguito". Unique flavor, exquisite aroma, elegant and appealing shape, distinguish this habano called to be the perfect company of those who please to discover the secrets of the best tobacco of the world. Trinidad is presented in boxes of natural cedar with brooch, of 24 and 50 units. The three cigars, Reyes (11/1.59 cm), Coloniales (13.2/1.75 cm) and Robusto Extra (15.5/1.99 cm) are new format sizes that are not available in the other Habanos brands, a policy that is also intended to emphasise the unique position of the Trinidad series.